Abner T. Allen (1813-1901) moved from South Warren, Massachusetts to Chagrin Falls, Ohio in November 1838 with his brother Amasa I. Allen (1818?-1906). This was at the time that the railway opened between Worcester, Massachusetts and Springfield, Ohio. In New England, the Allens left behind his parents, Pardon and Ruth Allen, and siblings. Abner T. Allen married Eunice Shepard (1814-1886) in September 1839. Amasa I. Allen wed Wealthy Holmes (1822?-1893) in 1851. They are considered pioneers of Chagrin Falls. The Abner T. Allen Papers consist primarily of Allen's correspondence with family in New England during the mid- to late-1800s. The papers of Abner T. Allen reflect his life as a farmer and merchant in the state of Ohio during the 1800's. The correspondence is typical of this period as the letter itself is folded to form the envelope, the address is printed on the outside, and the fold sealed with a wax seal. The majority of the correspondence was to Abner T. Allen from his parents, brothers and sister. These letters concerned all aspects of family affairs and travel between Chagrin Falls, Ohio, South and Western Warren, Massachusetts and New Hartford, Connecticut, where each of the families resided. The collection includes the following documents: leaf of cash transactions, booklet of expenses and revenues, an award. and two Last Will and Testaments; also included are invitations to social affairs. An item-level container list is included. See .pdf below. 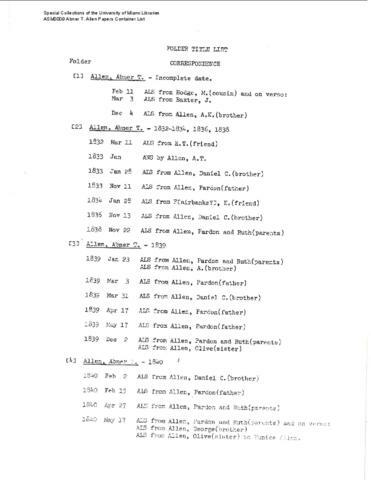 Abner T. Allen Papers Finding Aid © 2004 University of Miami. All rights reserved. Requests to reproduce or publish materials from this collection should be directed to asc.library@miami.edu. The papers of Abner T. Allen, farmer and merchant of the state of Ohio, were found among other material that appeared to have been purchased. Provenance remains unknown.